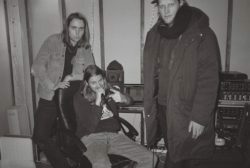 Norwegian rockers Okkultokrati reveal a trio of live dates on the horizon in Sweden and Denmark, where they shall be road testing new material that they are currently working on. Their previous acclaimed album Raspberry Dawn was released via Southern Lord in 2016 – more on that album below. While paying homage to their native 1990s black metal heritage, the cinematic synth/goth rock of the prior decade, and the raging early punk movement ahead of that, Okkultokrati still manages to create sincerely original and infectious music through every bar of Raspberry Dawn, resulting in a starkly raw and original sounding album. On Raspberry Dawn, Okkultokrati thrusts the heretic rock and roll that they have cultivated since their 2008 inception into more extraordinary situations. Classic ‘70s riffing, snotty punk, and brash, old-school metal are inventively mixed with pulses and spikes of darkwave and ice cold, psychedelic repetition. They execute these infectious tunes effortlessly, playing with the attitude they retained from their roots in rural hard rock attitude, and busting a propulsive stomp that aligns them closer to the clarity of recordings from decades past, also exemplified by spring reverb twangs that ping across the mix like rubber bands. With organ touches, violent slaps of static, and blown out sci-fi overtures backed by the band’s preexisting taste for the curious and the macabre, amping-up both the drama and the feel-good extremes that they have always lathered their sound in, Raspberry Dawn is weird, wired, and quite possibly the holy grail for those looking for radical rock reinvention and new sensations in the current era.